Discover the perfect seaside destination. Nestled between rugged bush and the tranquil sea, Port Stephens is a wonderful collection of seaside villages surrounding a majestic bay. Dotted along the Pacific Ocean coast, in the Port Stephens region, you’ll discover the wonderful variety of towns and villages. Nelson Bay is a coastal resort town of approximately 5000 people located just inside the mouth of Port Stephens, a large natural harbour. Despite its growing popularity, the town treads a sensible line between tourism and charm. 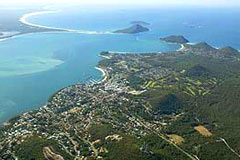 Nelson Bay, the largest town of the Port Stephens area, is 223 km north of Sydney via the Pacific Highway, 69 km from Newcastle by road and 18 m above sea-level. Read more about Nelson Bay. Originally called Hannah Bay, which in accordance to legend was named after the vessel Hannah, alleged to have wrecked at One Mile Beach in the early days of Port Stephens. Fact? Well a schooner named Hanna is recorded in wrecks on the NSW North Coast, to have wrecked in 1851, but was never identified. The vessel may have been a small trader, well known locally. Read more about Anna Bay. 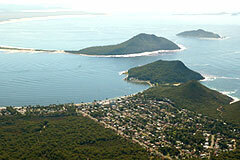 The picturesque village of Fingal Bay is surrounded by the Tomaree National Park. A magnificent beach with an infamous walk across “the spit” to view the burnt out ruins of the outer lighthouse residence. Explore Fingal Head and enjoy the views. Read more about Fingal Bay. The township offers a variety of gentle, coastal walking trails and a central boat ramp provides direct access to the port’s mainstream. Lemon Tree Passage, which has attracted an increasing number of retirees in recent years, is one of the prime secluded spots on the southern shore of a waterway which is now firmly established among the finest aquatic playgrounds on Australia’s east coast. Read more about Lemon Tree Passage. Salamander Bay offers it’s own charming and unique attractions for visitors. Time here is best spent outdoors, either exploring the beautiful bay or surrounding parkland or simply pulling out the picnic set and lazing in the sun. Read more about Salamander Bay. Shoal Bay is a picture perfect coastal village, the ultimate relaxing holiday dastination. There is a holiday park and you can hire catamarans, paddleboats, surf skis, sailboards, canoes and waterscooters on the beach (in season). You can also enjoy waterskiing and paragliding at Shoal Bay. Read more about Shoal Bay. Soldiers Point lies on a peninsula that juts out from the southern shores of Port Stephens and separates the eastern third of the port from the western two-thirds. Read more about Soldiers Point. Located west of Lemon Tree Passage is Tanilba Bay. ‘Tanilba’ is said to mean ‘place of white flowers’, presumably a reference to the flannel flowers which formerly thrived in the area. Read more about Tanilba Bay. There is something for everyone in this rich and diverse region, you will find the perfect holiday escape right here in Port Stephens.